Abstract: Turbo Pascal 3 was the first Turbo Pascal version to support overlays, the Intel 8087 math co-processor and BCD math. Turbo Pascal 3 was the first Turbo Pascal version to support the Intel 8087 math co-processor (16-bit PC version). It also included support for Binary Coded Decimal (BCD) math to eliminate round off errors in business applications. Turbo Pascal 3 also allowed you to build larger programs (> 64k bytes) using overlays. The PC version also supported Turtle Graphics, Color, Sound, Window Routines, and more. Click through to the Turbo Pascal 3.02 download page to download the software. Note: the zip file is 170209 bytes. When you are finished downloading the software, use your favorite zip utility (like PKZIP or WinZip) to decompress the zip file to a folder on your hard drive. Below are scanned images of the front and back covers of the Turbo Pascal 3 manual. Back in those days the manual was the product. The floppy disk placed inside the manual cover along with the license agreement, invitation to join us on our CompuServer forums (now we use Internet newsgroups), and other paper marketing pieces. Click on each image to display a larger version of each cover. TurboPascal. Version 3.0 with 8087 support and BCD reals Free MicroCalc Spreadsheet With Commented Source Code! One-Step Compile: No hunting and fishing expeditions! Turbo finds the errors, takes you to them, lets you correct them, and instantly recompiles. You're off and running in record time. Built-in Interactive Editor: WordStar. -like easy editing lets you debug quickly. Automatic Overlays: Fits big programs into small amounts of memory. MicroCalc: A sample spreadsheet on your disk with ready-to-compile source code. IBM PC Version: Supports Turtle Graphics, color, sound, full tree directories, window routines, input/output redirection, and much more. More than 500,000 users worldwide. Turbo Pascal is the de facto industry standard. Turbo Pascal wins PC Magazine's award for technical excellence. 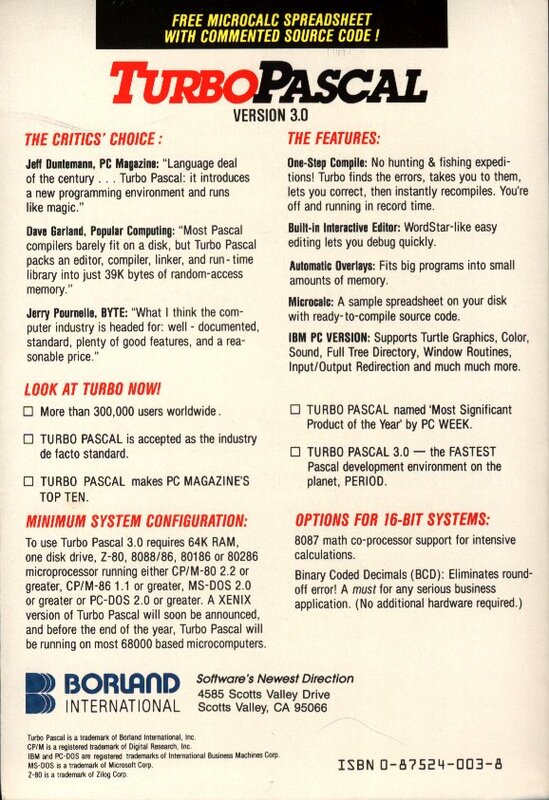 Turbo Pascal named "Most Significant Product of the Year" by PC Week. Turbo Pascal 3.0 - the fastest Pascal development environment on the planet, period. Features for 16-bit Systems: 8087 math co-processor support for intensive calculations. Binary Coded Decimals (BCD): eliminates round-off error! A must for any serious business application. Minimum system configuration: 128K RAM minimum. Includes 8087 & BCD features for 16-bit MS-DOS 2.0 or later and CP/M-86 1.1 or later. CP/M-80 version 2.2 or later 48K RAM minimum (8087 and BCD features not available). 8087 version requires 8087 or 80287 co-processor. 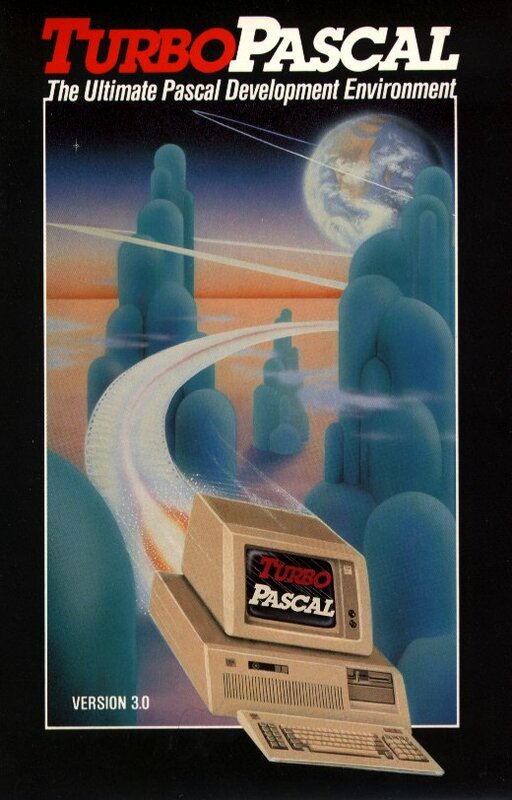 Turbo Pascal is a registered trademark of Borland International, Inc. CP/M is a registered trademark of Digital Research Inc. IBM is a registered trademark of International Business Machines Corp. MS-DOS is a registered trademark of Microsoft Corp. WordStar is a registered trademark of MicroPro International. The following is the Readme file that came with Turbo Pascal 3.02. Please notice that any mention of support, references to phone numbers or addresses are here for historical purposes. Since this is antique software, there is no developer support for this product. If you have questions, you should ask them on our Internet newsgroups. You might find an old timer who still remembers using this version of Turbo Pascal. computers do not come with the 8087 chip installed. Pascal Reference Manual for common questions and answers. 2. Computer name, model and any additional hardware. 1. Type GO BORLAND on the CompuServe bulletin board system. 2. Check with your local software dealer or user group. 1. Turbo Pascal no longer does a ClrScr when your program first begins. if they were not modified. You should also place a "FILES = 20"
more information about DOS file handles. re: I still use Turbo Pascal v3.02, and I love it! You can use TP6.0 without any of the OO features and you'll finf that your programs will probably be a lot smaller and faster! I still use Turbo Pascal v3.02, and I love it!